A little over a month ago, Google said it was ready to add HTTP/2 to Chrome. Now, with the final draft version of HTTP/2 done, Google is ready to start building HTTP/2 into versions of its browser. The company recently added HTTP/2 support to Canary, the early test build of Chrome where the company introduces new features first. HTTP/2 is the successor to Google's SPDY protocol and the current version of HTTP. Why this matters: HTTP/2 promises some big performance improvements over the current HTTP spec. It promises to make websites load faster in your browser and reduce the workload for servers. It will take time, however, before HTTP/2 makes a noticeable difference to everyday web browsing. Before it can improve web performance, any problems with the new protocol must be worked out and server admins need to figure out how to take advantage of the new spec. 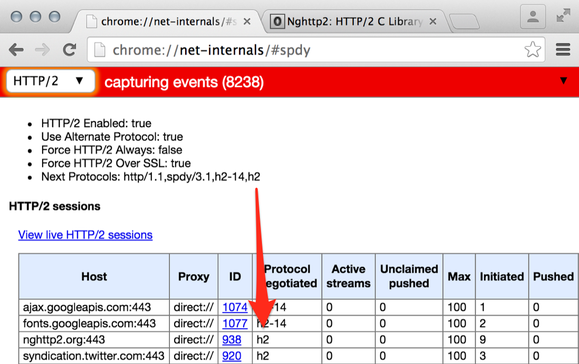 HTTP/2 support active in Google Chrome's Canary build. While SPDY will ultimately be dumped from Chrome, Google plans on a slow decline for the protocol. Chrome builds will continue to support SPDY until early 2016 to give HTTP/2 time to get up and running. Google hasn't said when HTTP/2 will graduate from Canary into the Chrome beta build and then ultimately the stable version of Google's browser. The entire process will likely take months. HTTP/2 entered into the final draft stage in early February, and is now going through the final editing process. Google may wait until HTTP/2 is finalized before going much further than the beta build of Chrome. HTTP/2 probably won't be of much use to regular users right now, but developers that want to check out HTTP/2 can download Canary from Google. Canary runs separately from Chrome, so unlike the beta or developer builds you do not need to uninstall your primary version of Chrome to run it.